Lesvos is the third largest of the islands in Greece behind Crete and Evia. Despite being green and beautiful it remains virtually unaffected by mass tourism. Homer refers to Lesvos in the Iliad and the Odyssey. Lesvos is where Menelaos, Diomedes and Ulysses met, after the siege of Troy, to decide on the way of their return. Sappho was born in Eressos around 615 BC. Sappho is not only one of the few women poets we know of from antiquity, but also is one of the greatest lyric poets from any age. Put simply, there is no other Greek island quite like Lesvos. 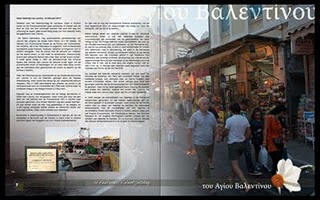 Lesvos was Aristotle’s inspiration to write books on biology that were the founding of the science that we know today. Lesvos was the birthplace of Theophrastus who is the father of botany. There are many easy to find websites that will help you discover more about Lesvos. So I thought I would list here some of the more unusual and interesting sites that you can use to explore the life of this wonderful Island. First (and clearly most important)…. You can read more about Lesvos in my Blog. Julie Smit & Jan van Lent live in Eftalou. Julie writes a charming and witty blog about life on Lesvos in both Dutch and English. If you want to see the island through Julie’s eyes then you must pay SMITAKI a visit.Julie and Jan have also produced a beautiful book Scatterlight Donkeys & Foxballs Ice Cream published in February 2011, this is not a tour guide but a must have for all lovers of the island. 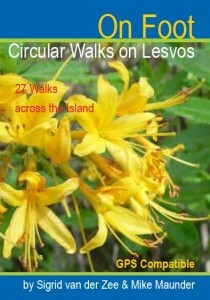 Lesvos is the perfect island for walkers young and old. Whether you feel like a short stroll or an all-day hike, the 25 walks in On Foot in North Lesvos will guide you step by step along local tracks and paths through some of the best scenery and to some of the most interesting places in its main holiday area. The book is written by Mike Maunder and Sigrid van der Zee, and has grown out of their local knowledge and shared love of walking. They each first came to Lesvos like most people, on package holidays from the UK and Netherlands. Both decided that this was ‘their’ island, and returned year after year. Sigrid settled permanently in 2000, working as a guide. She met and married a local fisherman, and now has a small son. In 2004 Mike found a house in an olive grove, and since then has spent at least six months of each year there. If you are visiting Eftalou for the Thermal Springs (or just a quiet swim) you should pay a visit to Elleni’s Workshop. You will be able to view the unique olive-wood sculptures and paintings of local artist Eric Kempson. They also have a range of locally hand-crafted olive-wood and gemstone necklaces & earrings. 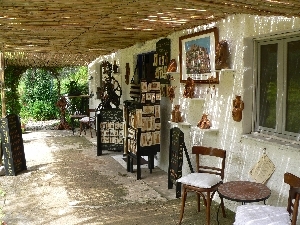 They also specialise in high quality linen and lace.It is worth a visit just to sit in the peaceful shade of the olive grove, listen to the birds singing in the trees and meet the world famous Edvard in person.